Ah, the South Pacific seas... warm sun, clear skies, crystal waters, and... two islands obsessed with destroying each other's palm trees! 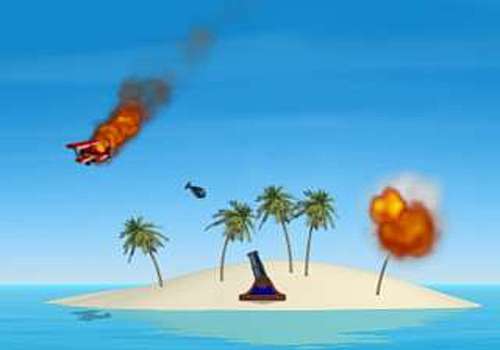 Hop in your biplane and bomb the enemy island, or use your cannon to protect your own. Engage in aerial dogfights while collecting bonuses to defeat 10 opposing islands. Features 6 gametypes, 7 mutators, 10 gameplay parameters, 5 skill levels, bonuses, worldwide high scores. 1 or 2 players. Jeu d'action 3D tourelle. Défendre les villes sur les planètes de la Confédération contre l'attaque extraterrestre et les météorites !